Quite a biting cold along the Rillito this morning with frosty breath (need to add that cold here in Sonoran Desert is all relative compared to places like Fargo North Decoder). Had 32F on one thermometer here at house and 34F on other, so will record low as 33F. Was undoubtedly below freezing down along the wash. October 2013 ends as an unusually cool month here at the house. There were 12 mornings with low temperatures in the 30s - today being the coldest of the month. 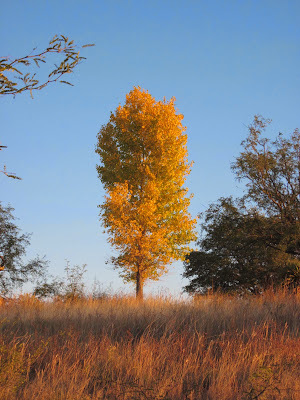 In comparison October 2012 had only two such mornings. As for rainfall there was absolutely none this year, while 2012 had 0.02". 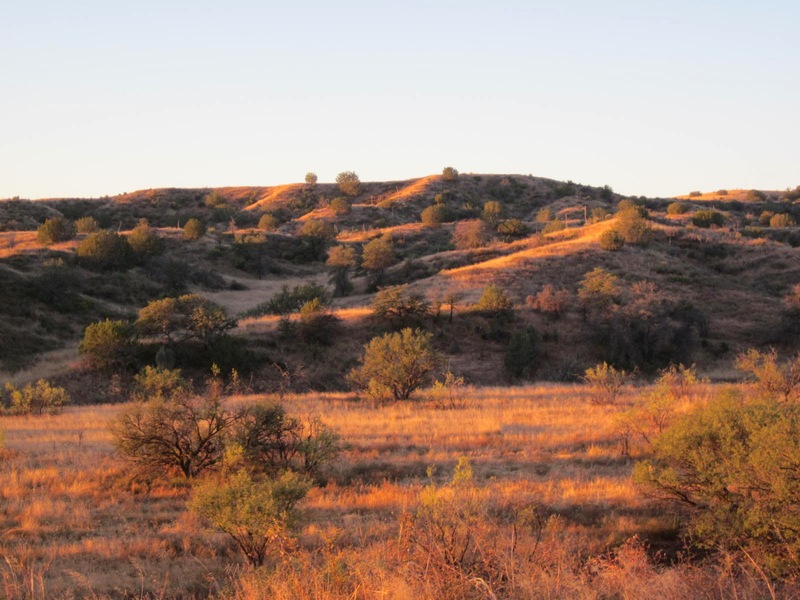 The desert along portions of I-10 between Tucson and Phoenix resembles scenes from Mad Max, due to nearly a century of over-grazing and commercial agriculture during recent decades. This corridor is prone to serious dust storms and multiple vehicle crashes. 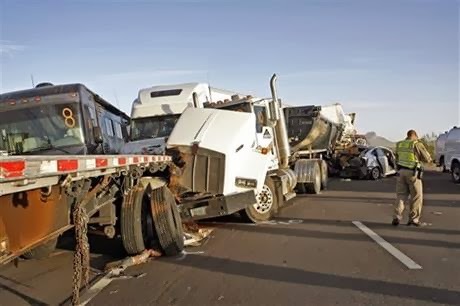 Yesterday afternoon blowing dust south of Casa Grande resulted in a pileup involving about 20 vehicles, many of them 16-wheelers (see above). There were three fatalities and many injuries, leaving I-10 westbound closed for more than five hours. The 5 pm webcam view of the Catalinas, from the Computer Science Building, at 5 pm MST yesterday (above) appears to have captured some of the dust storm in the distance - at lower, left corner of the image. There were also thunderstorms with some lightning strikes along the Mogollon Rim (below) yesterday afternoon as the 500 mb short wave slowly moved eastward across the state. Yesterday afternoon turned cloudy and very dreary, as thick cirrus streamed in from the west-southwest. 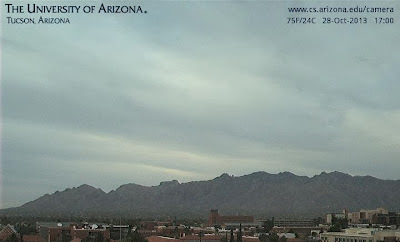 There was a bit of dust in the air also, as the 5 pm MST view of the Catalinas (above) indicates. However, the surface observations from TUS (below) indicate that the day was characterized by clear (CLR) skies. The reason is that the automated "observing" system (ASOS) used by the NWS only detects clouds below 12,000 ft AGL. Thus, the discrepancy between actual sky conditions versus the ASOS "observed" sky conditions. 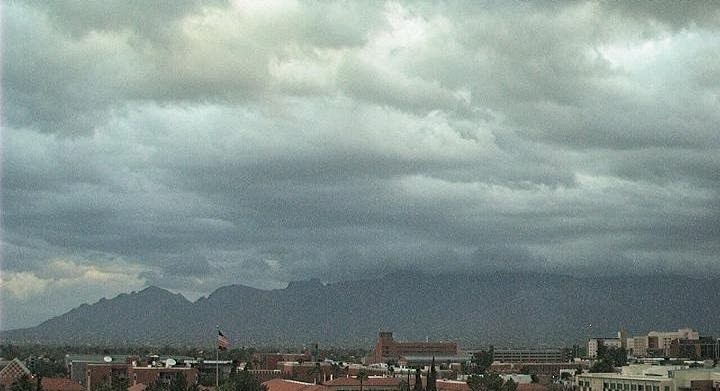 At larger airports, as per Phoenix's Sky Harbor, the ASOS observations are augmented through the addition of human-observed cloud-cover information. The visible satellite image (above, from 3:45 pm MST) shows the thick cirrus streaming east-northeastward from northern Baja. Strong flow over the mountain ridge-line of Baja induced an orographic enhancement of the cirrus and gave us our dreary afternoon. Direct solar radiation, as measured at Atmo (green curve below) indicates the impact of the cloudiness beginning after 10 am MST, with very low solar radiation values after 2 pm. The strong, 500 mb closed low over western Nevada is forecast by the latest NAM to move slowly east-northeastward and gradually weaken during the next 48-hours. As the system moves across the northern Great Basin today it will produce strong and gusty winds across most of the Southwest. Here are several forecasts from the early, 06 UTC, WRF-NAM forecast runs at Atmo this morning. Above is forecast of 10-m winds, on the 5.4 km grid, valid at 8 am this morning (Monday, October 28th). Strongest winds at that time were forecast over far northwest Arizona and the southern great Basin. The system is fairly dry and the model forecast of total precipitation through midnight tomorrow night is shown below, again on the 5.4 km grid. Heaviest precipitation from this event forecast to be in western Nevada and the California Sierra Nevada range. Arizona picks up some precipitation, mostly on the Kaibab Plateau and along the Mogollan Rim country. Here in southern Arizona winds are forecast (above is 10-m winds on the 1.8 km grid valid at 5 pm MST) to be strong during the afternoon today, but not nearly as strong as to the north. 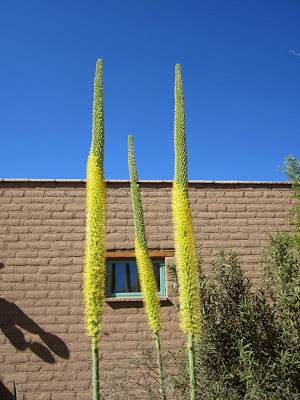 There will probably be some local blowing dust. 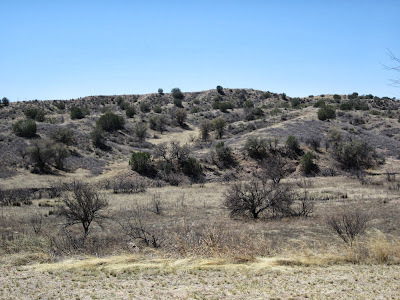 The soil here along the Rillito is powder dry, as it has been most of the summer. Raymond has intensified again and is currently a Cat. 2 Hurricane. Visible image of Raymond above is from 2100 UTC this afternoon - Sunday, October 27th. Below is NHC forecast of the probabilities of tropical storm winds for the next 5-days. Although heading northward, Raymond weakens dramatically before reaching latitude 20 North. 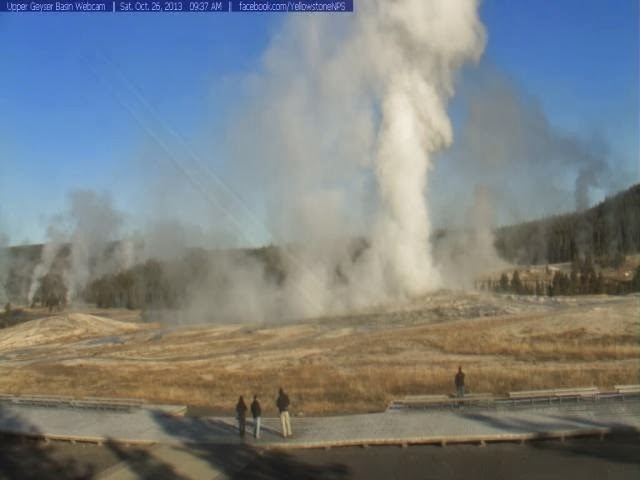 Was browsing Jack Hales Web cam page when I noticed Old Faithful, in Yellowstone NP, was about to do its thing. Photos here are 3-minutes apart. Not a big turnout this morning. 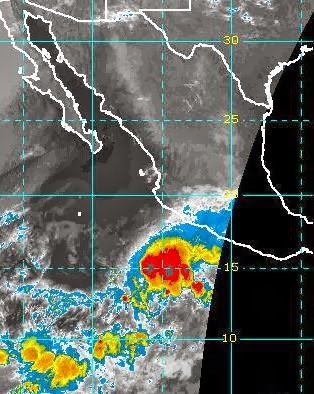 Tropical Storm Raymond is currently moving westward away from Mexico - above IR image is from 1430 UTC this morning. The forecast for Raymond is a bit uncertain at this time, although it is expected to turn northward early next week. Storms Francisco and Super-Typhoon Lekima continue moving northward across the western Pacific (IR image above is from 0600 UTC this morning). By 26/1200 UTC they are forecast to be fairly close together, east of northern Japan. The GFS surface forecast valid at that time shows a complex surface low that is made up of extratopical remnants of Lekima and Francisco and another low from the Asian continent. This low eventually forms into two separate cyclones that move east-northeastward and push a low to their northeast northward across the Aleutians. Next week these two cyclones move across the Gulf of Alaska, with strong ridging to their east - thus, forcing the 500 mb low along the west coast to dig southward. A very complex setting and a tough challenge for the global models. 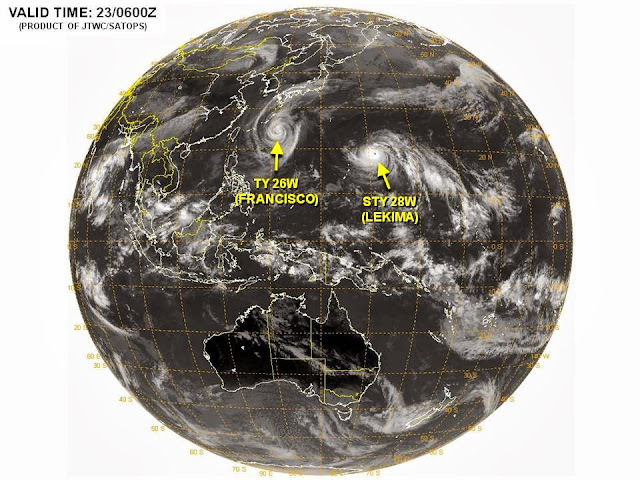 The presence of two typhoons over the Pacific (image above is IR from 06 UTC this morning) will complicate the predictability of the global models over the weekend and early next week. 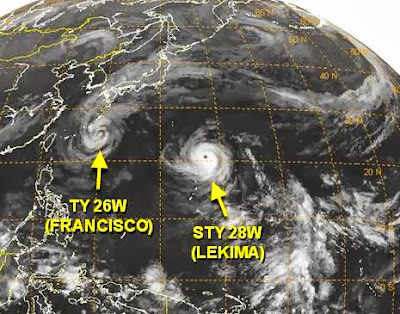 Lekima is a Cat 5, super-typhoon currently with winds over 150 mph. Both of these storms are forecast to become extra-tropical and head into the north Pacific, south of Alaska. The GFS ensembles are fairly consistent out to 120-hours but then by 168-hours (grahic below shows 168-hour GFS ensemble average -left- and spaghetti plot of member solutions - right- all at 500 mb) there is very substantial spread among the forecasts. The uncertainty is centered over the eastern Pacific and western US. It will be interesting to watch how this all plays out. Some ensemble members even bring the remnants of Hurricane Raymond into play. Photos here all taken at Santa Rita Abbey during 2013. Top - April, middle above - August, and bottom above - October (this past Saturday). Below top - August, below middle - October, and bottom - October. 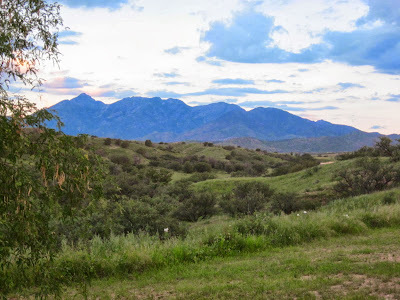 The transitions into and out of the summer rainy season are really quite extreme, especially around 5,000 feet MSL, which is well out of the desert and also above the desert scrublands. The following showed up in my email a couple of days ago. Such a reform would certainly solve the current mess, but is of course unlikely, since it would end most all of the reasons why politicians run for Congressional seats. Warren Buffet, in a recent interview with CNBC, offers one of the best quotes about the debt ceiling: "I could end the deficit in 5 minutes," he told CNBC. "You just pass a law that says that anytime there is a deficit of more than 3% of GDP, all sitting members of Congress are ineligible for re-election. Congressman/woman collects a salary while in office and receives no pay when they're out of office. All funds in the Congressional retirement fund move to the Social Security system immediately. All future funds flow into the Social Security system, and Congress participates with all of the American people. It may not be used for any other purpose. 3. Congress can purchase their own retirement plan, just as regular Americans do. 7. All contracts with past and present Congressmen/women are void effective 12/1/13. The American people did not make this contract with Congressmen/women. Congress made all these contracts for themselves. Serving in Congress is an honor, not a career. Edited on Monday, October 21st to add: Raymond was upgraded to a hurricane last evening and, after intensifying rapidly during the night, is now classified as a Cat. 3 hurricane. 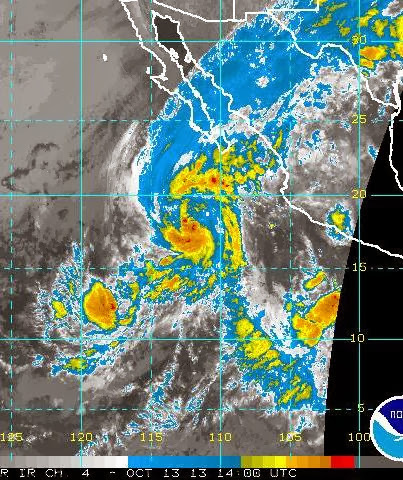 Tropical Storm Raymond developed off the coast of southern Mexico yesterday. The latest NHC forecast for Raymond is shown above. The storm is forecast to become a hurricane while drifting slowly north until midweek when it begins moving rapidly to the west-southwest. Below is a visible satellite image showing Raymond at 2045 UTC this afternoon (Sunday, October 20th). 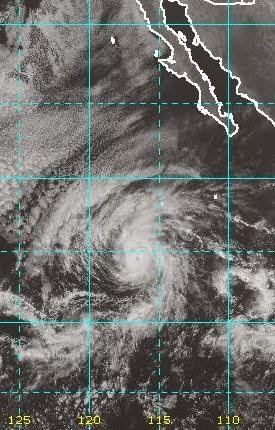 Note the eye structure present, indicating that Raymond may already be a hurricane. 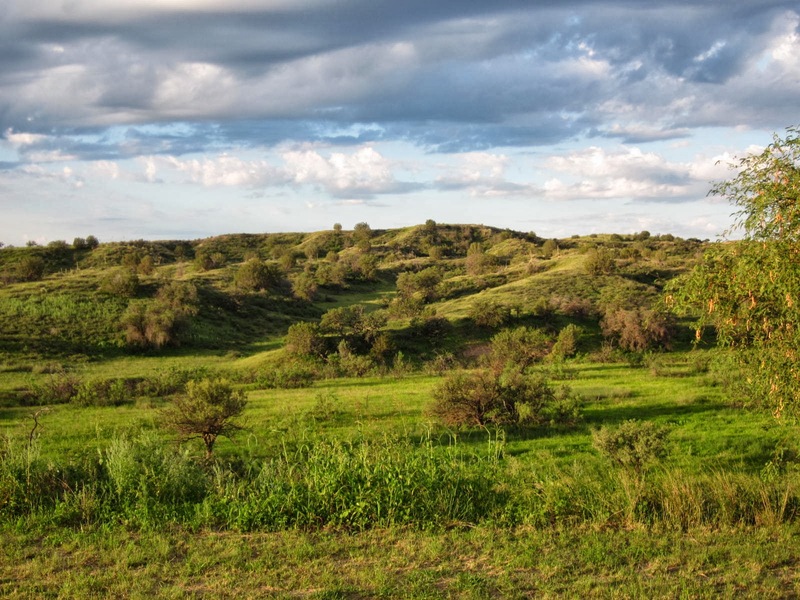 SOUTHERN THIRD - THE NORTHERN ROCKIES - THE HIGH PLAINS AND THE OHIO VALLEY. FOR SOME PARTS OF THE WARM SEASON AS WELL. I've shown two more outlooks here that illustrate another head scratcher. At the top is the current 8-14 day temperature outlook valid through October 31st. Below is the current outlook for November temperature. To me these indicate almost a binary transition to a different pattern at the end of October, since I don't see any evidence of a transition between the two maps. First - today's temperature update. Low this morning at the house was 35 F versus 49 F at the airport official observing site. We are in a classic radiational cooling situation where morning lows are not well-correlated with elevation, since low elevation sites with drainage flow can be colder than high elevation sites. The closest RAWS stations (all higher to much higher elevations than here at house) mostly had warmer readings this morning: Sasabe - 35 F, Empire - 36 F, Saguaro - 44 F, Mt. Hopkins - 46 F, Rincon - 37 F, and Sollers (Mt. 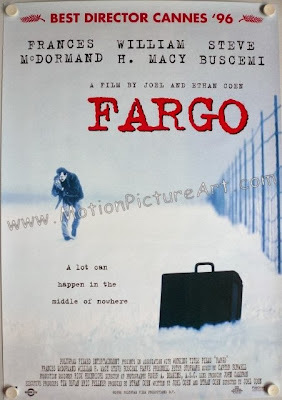 Lemmon) - 40 F.
An earlier post generated the following question: Hi Bob: It would interesting to see whether you agree with the NWS's 2, 3 months and out forecast. To a non-professional, the start of this fall portends a colder winter, not a 60% chance of above normal temps. These fronts that are coming direct from the Gulf of Alaska appear to be happening more often. Or am I misinterpreting what is going on???? I assume that the question refers to the various longer-range forecasts issued by the NWS Climate Prediction Center (CPC). I have posted their current NDJ three-month outlooks for temperature (above) and precipitation (below). My basic answer is that I almost never look at these products, since they are so vague as to be almost meaningless. I have to admit that I don't know how these forecasts are generated, and I'll explore that issue some tomorrow. When I do take a look at them, I usually end up scratching my head about some details. There was some controversy a year or so ago regarding the seasonal temperature outlooks. It appeared that CPC was "gaming" the forecasts to reflect the long-term trend in temperatures (the issue being what is long-term normal when there is are upward trends in temperatures, especially in morning lows?). Another example of something puzzling is the "A" area below, indicating above normal precipitation for the three-month period over Montana, Wyoming, and parts of Idaho. What weather patterns would lead to this outcome? It does not seem to reflect more frequent or wetter systems coming into the Northwest. The only thing I can guess is that the area reflects more frequent, or wetter, upslope conditions and that whatever is causing this does not have a corresponding impact on seasonal temperatures, nor have much impact on precipitation to the east and southeast of higher than average area. This all seems strange to me, especially when what I am interpreting as "upslope" affects both sides of the Continental Divide. In the shorter-term, CPC's 6-10 forecast does reflect strongly the current and forecast large-scale patterns over North America, as one would certainly expect. An early start to the Australian wildfire season as serious fires are burning in New South Wales, near Sydney. Several booksellers in the Blue Mountain area have been posting blow-by-blow accounts, on a book dealer chat board, of the fires and evacuations. The early spring has been hot and dry down there and the GFS, 00 UTC, 500 mb analysis below shows that a strong front crossed NSW yesterday. The front was dry, but accompanied by very strong winds that worsened fire conditions. First - coolest morning of the Fall so far today. Low hit 38F here at house versus 50F at the airport. Was actually cold when I walked at sunrise down in the Rillito Wash. Looks like low temps relative to the airport will be one of the few local weather topics for next week or so - see below. Shown above is the 60-h GFS ensemble mean forecast for 500 mb. The strong ridge over the western portion of North America extends eastward, at high latitudes, into the north Atlantic. The ridge still persists in the 240-h mean forecast below, although heights have fallen over the north Atlantic. Weather will continue cool and unsettled over the eastern 2/3rds of the US, while the West is blocked-out wrt weather systems in the westerlies. 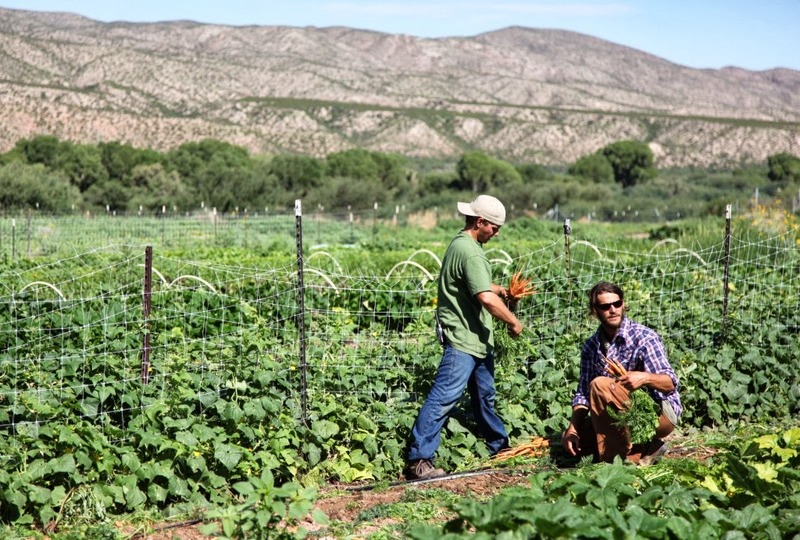 Will October pass without rain here in the Southwest? Sleeping Frog Farms reported in their last newsletter that the first frost of the Fall occurred there on the morning of October 6th (low here was 39F that morning). 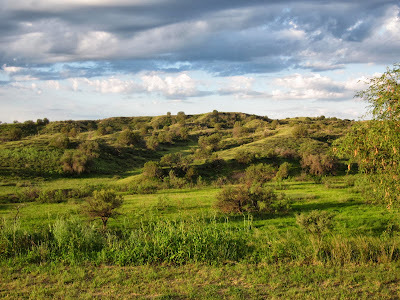 The Sleeping Frog is along the San Pedro River north of Benson - photo above. The frost was light but did cause some damage to sweet potato greens and peppers. First frosts of Fall around Wilcox area and north on the same morning as reported above, which also had temperatures in low 30s in the San Pedro Valley to his east. 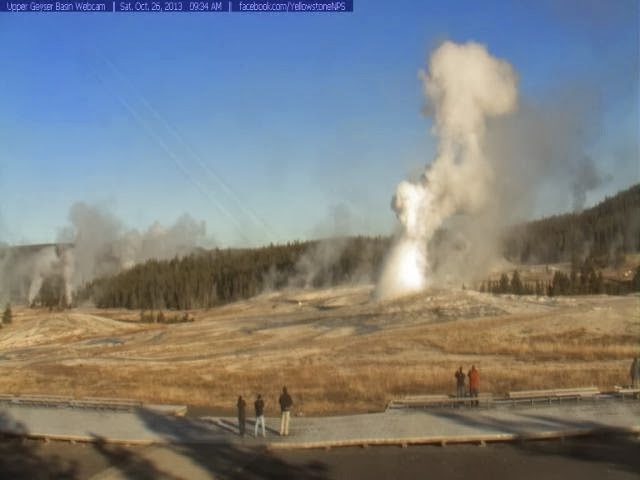 Strong winds at his place (>40 mph) on both the 9th and 10th of October. 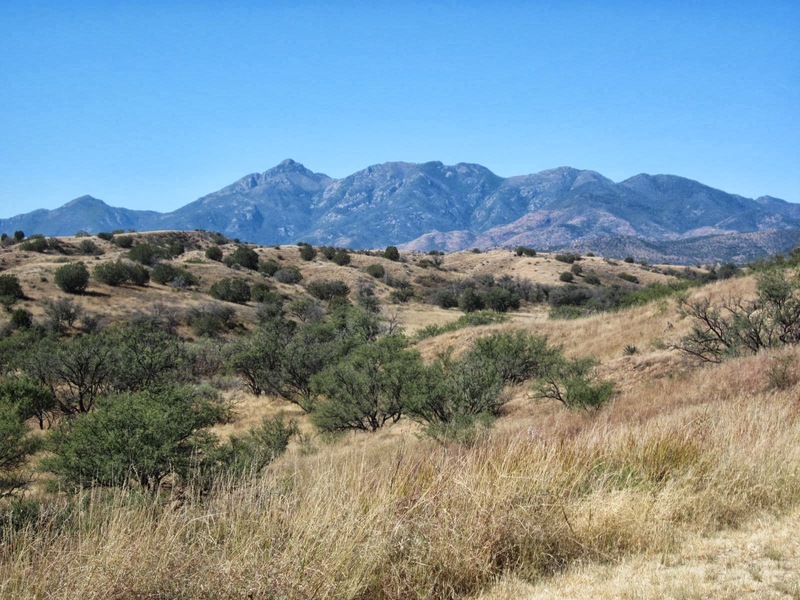 Some nearby sites had winds over 50 mph and Art reports some wind damage to trees along and near the east slopes of the Huachuca mountains. Finally, he reported rainfall at his place of 2.33 inches for September, giving him a Jun-Sep total of 16.84 inches. Tropical Storm Priscilla has developed to the south-southwest of TS Octave this morning. Current positions as per NHC shown above and a 1330 UTC IR image is shown below. Both storms are forecast essentially to move to the north during the next several days, impacting primarily Mexico. Forecast probabilities of TS strength winds for both storms are shown at the bottom. 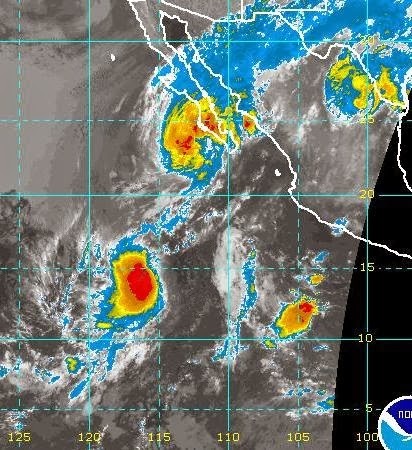 Tropical Storm Octave has developed in the eastern Pacific. Above is latest NHC forecast - which keeps it as a TS and moves it toward southern Baja as it decays into a remnant low. Below is IR satellite image from 14 UTC this morning, indicating quite a bit of conevtion to the northeast of the storm. Appears that westerly winds at base of western US trof will steer moisture associated with Octave into southern Baja, southern Sonora, and Sinaloa. The GFS operational member tends to be dry, but its forecast of 7-day total precipitation (above) for the period ending at 5 pm on Thursday the 17th of October keeps southern Arizona at the center of a huge void of rainfall. System that moved by yesterday is producing mostly rain over the northern High-Plains, which is probably a real relief for the Black Hills, which caught the brunt of the past blizzard. Today's weather "event" has pretty much moved away to the northeast. Above is visible satellite image from 1:30 pm and below is ALERT sector for Catalinas at 2 pm MST. 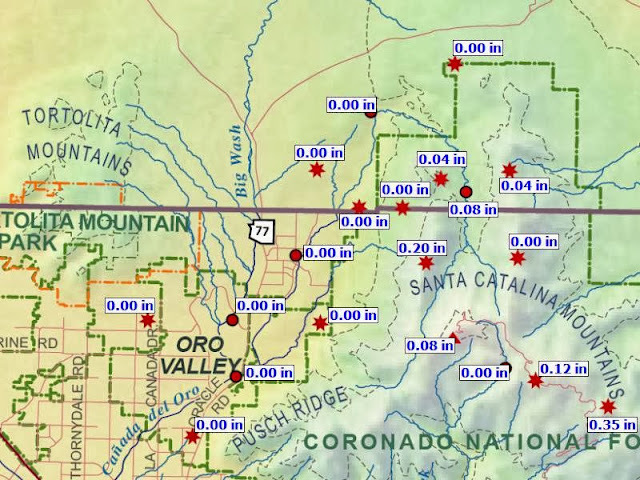 Rainfall was light and limited to the Catalina Mountains here in eastern Pima County - pretty much as forecast by Atmo's WRF model runs the last three days. The model may have over-forecast rainfall out in central Pima County. Strong winds continue to the east of Tucson and the very exposed RAWS station at Guthrie has gusted over 60 mph. 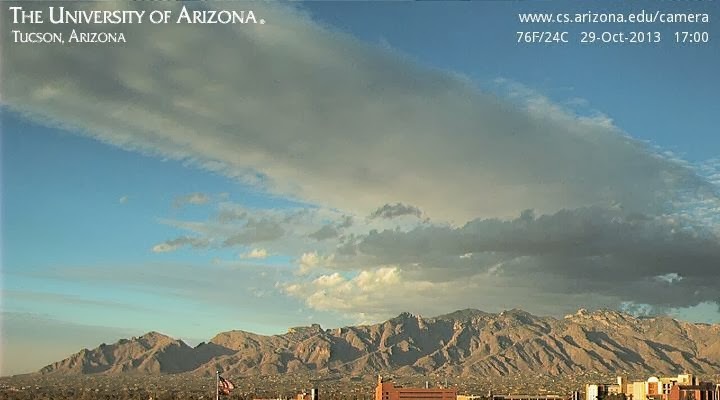 So, we ended up with wind and dust and no rainfall at lower elevations here in Tucson metro area. 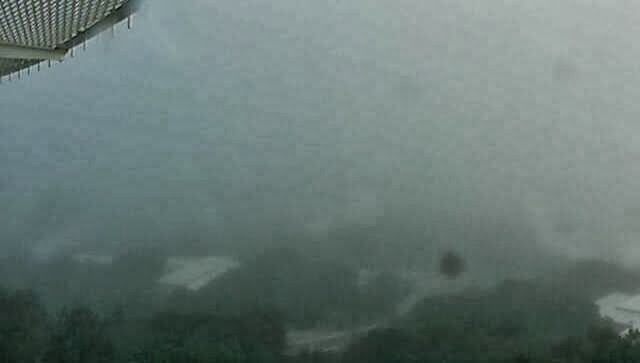 Edited to add - 7 am MST web cam views of Kitt Peak (above) in the clouds and of Catalinas (below) with heavy, low clouds. Morning sounding shows a shallow cloud layer from about 800 to 700 mb. Morning walk was easier on my return with west wind at my back. As the closed, 500 mb low moves into northwest Arizona, thunderstorms have returned to northeastern parts of the state. Graphic above shows lightning strikes during the six hours ending at 4 am this morning (10 October). Surface plot below is from 5 am and shows thunder, rain, and snow from northeastern Arizona into Utah and western Colorado. 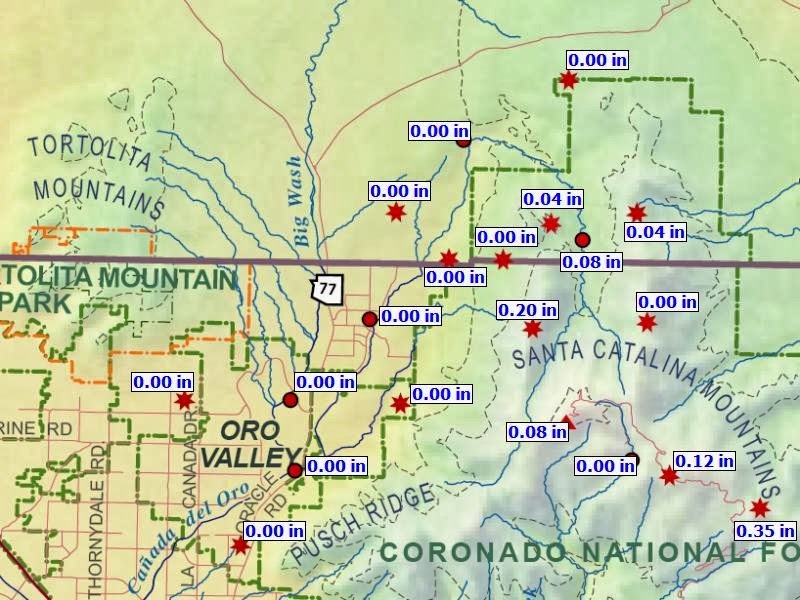 The Pacific cold front is just moving across eastern Pima County and at 5 am only 2 ALERT stations up in the Catalinas had reported precipitation.